tooling was used by K-Line for a series of modern production versions. I bought this Marx 333 at a recent train show. My portable layout needed another running O-Gauge loco and there was none in the packed up pile of stuff. The engine was stiff. It merely sparked a bit and hummed when I placed it on the track. About 5 minutes later with a little cleaning and lube, it was hauling the freight and entertaining the visitors. These things are robust. You can see it has been well-loved over the years and neglected perhaps just a little. Still, it provided a solid performance that day and many days since. There is much to love about these old trains. 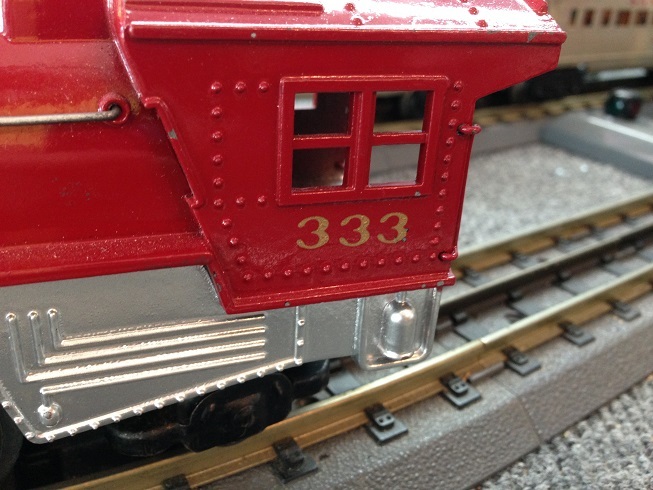 The Marx 333 is one of the best looking and smoothly running locos made by Marx. The rest of this page has more information about the 333 and some of its successors. Note: Marx 333 is a Pacific type loco with a Whyte clasification of 4-6-2. The Marx 1829 is a Hudson with 4-6-4 wheels. A link to a very nice page of 333 history Use your browser 'back' button to return here. The following discussion was mostly composed by Al Osterud with some supporting material from Steven Seguine. The information was published in a series of notes on the MarxTrain Group hosted by Yahoo. There were other contributors to the dialog. Those questions and comments are not included here. All of these notes appeared over a period of three months in the Spring of 2014. There may be a bit of repetition. Think of it as being similar to the early versions of the Greenberg guides - a collection of independent essays. Think of it as The Screwtape Letters (by C S Lewis) for toy trains. Some slight editing has been performed to limit just a bit of that repetition. I have also made some modest rearrangement of some of the parts. A link to the Yahoo Group can be found on the Links page. Look in the navigation table at the top of this page. Join the group and search the message archive to learn more. It is an excellent and very friendly Group. My First Rule of Marx should read "Whenever you say something about Marx is certain, or always, or never, you will find out later that you were wrong." Hi Steve, The non-smoking 333's had no awnings over the cab windows. And the earliest production run of the smoking 333's also had no awnings. But the bodies are different internally - the headlight bracket mounting lug in the front of the boiler of the non-smoker will interfere with the headlight on the smoking engine chassis. So they can't be switched without grinding out part of the inside of the boiler shell. Then the awnings were added on the rest (the vast majority) of the production runs of the smokers. Another 333 variation is in the main rods. From 1948 through 1952 the 333 had a side (piston) rod that attached to a complicated piston slide at the front with a small rivet. Tasker Brush believed and I believe there were no 333's produced in 1953. In 1954 only the 333's eliminated the complex piston sliders and used the same one-piece side rod as was used on the non-smoking 1829 plastic hudson. Then to make the smoke unit work beginning in 1955, both the 333 and the 1829 went back to the 1949-1952 style piston rod so it could push the plate that moved the smoke unit bellows. Then the tenders: I believe the 1948 333 locomotives came with the standard NYC tin wedge tender. From the first die-cast tender in 1949 through 1952 the 333 usually came with the die cast tender with a metal forked coupler. (From 1949 through 1952 a very few 333 sets were sold with the wedge tender as a way to hold down the cost of a set, and those sold with the wedge tender in the 1949 through 1952 period came with a trailing truck that did not include the spring for another few cents in cost savings. The rear truck is not a 999 rear truck, it is a 333 rear truck which includes the hole for mounting the spring, but no spring or mount for it is attached.) For 1954 only the 333 came with the die cast tender with a plastic forked coupler instead of the metal coupler that was used before, a slight difference in the New York Central lettering on the tender, and better paint that stuck better to the tender shell than on the earlier models. The plastic and metal forked couplers can't be switched successfully - the trucks are different. Then beginning in 1955, all 333's sold in the US came with plastic tenders. Some 1955 333's sold in Canada came with die-cast tenders with plastic forked couplers, which I believe was to use up leftover inventory. Hope the above is helpful. You can collect 333's for years and not have them all. Hi Allan, Thank you for this detailed explanation of the 333 and 1829. It seems me that many of the variations were a straight line changes, meaning that once they were made there was no going back. 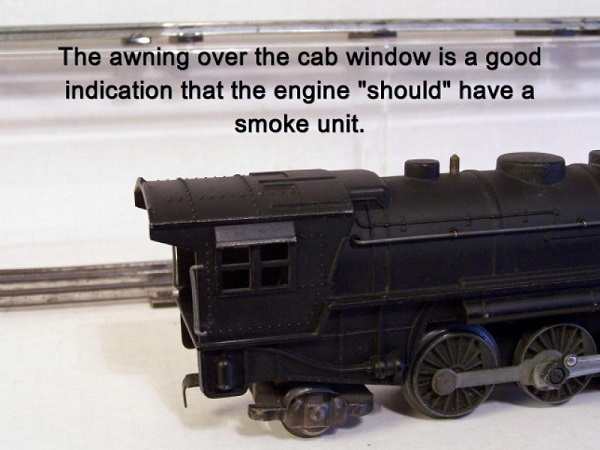 Once the cab awnings were added there would no longer be any non-cab awning bodies made, and once smoke was added there were no more non-smokers made. You did not address the motor change from single to double reduction. I believe that this change coincided with the application of smoke to these engines. 1955, smoker added, cab window awning, change to double reduction gearing, change back to riveted piston/main rod, change to plastic 1951 tender. I know that this breaks the first rule of Marx but it lets me get my head around the subject. Do you see any errors with it? 2018-02-07 This just in. Our best information is that all of the Marx 333 had double-reduction gearing. Some are implemented in a way that is harder to see than are others. Hopefully, we now know that there were no Marx 333 produced by the factory with single-reduction chassis. Hi again Steve, I will add some more this evening to the 333 variations message I wrote last night and will also add some additional 1829 locomotive details. I think the timeline you laid out below is a pretty good summary. And I agree that once a change was made, there was no going back. The following may be more than most people ever wanted to know about the 333, but here goes! I did not comment on the motors last night, partly because I wanted to look at my 1954 333's again before I commented. I think it is most likely correct that the non-smokers are all single reduction motors and the smokers are all double reduction. In my experience the 1954 engines run so well that I was not sure last night. I don't know why they seem to run better than the earlier engines, but mine do. Perhaps the ones I have just have fewer miles on them as I see no differences in the motor itself other than the beveled edges on the 1954 trolley shoe and the cast brass brush holders on the 1954 motor instead of the stamped tin versions on the other 333s that I am looking at tonight. Perhaps the cast brush holder tubes make a bigger difference than I realized before. What year those two changes were made I am not sure yet. Tasker Brush had studied those motor changes in detail and knew exactly when each change was made. I will need to search my e-mails from him to see if he ever put that in writing. One other change that took place on the 1954 333s was a change from the early front truck with the screw hole offset to the rear (which pushes the wheels forward under the body). The early front truck has a peg sticking up in the front which is supposed to keep the truck from turning around. The later 4-wheel front trucks have the screw hole centered and do not have that vertical peg. I like the looks of the earlier front truck better as pushing the wheels forward fills in some of the excess space between the pilot and the first set of wheels. With the later front truck, the wheels are moved aft a noticeable amount. I had originally thought that change took place in 1955 with the introduction of smoke, but here it is a year earlier. I suspect this may have been a running change, and I would not be surprised to also find 1954 engines with the earlier front truck, but I just don't know yet. When the front truck change was made on the 1829 plastic Hudson, Marx notched the steam chests at the front to so the front-most wheels would not scrape the body when the truck was moved back. That is the only difference I knew of in the body of the 1829 between the non-smoker (no steam chest notches) and the smoker (with steam chest notches). At this point I don't know whether the 1954 production non-smoking 1829s had the earlier or the later front truck, but I will be exploring that now. To complicate matters, Sears offered exactly the same 1829 set in 1953 and 1954 and both had the same set number. It seems unlikely that all of the sets sold in 1954 were left-overs from 1953, but they could have been. There were other running changes on the 333s. The earliest ones used a small sholder bolt to attach the small valve gear piece to the eccentric. That was changed to a rivet early in the life of the 333. I also find it interesting that the plate in the front of the cab is cut wrong for the small forward cab windows. The cuts in the plate are too high and the window is partly blocked. But Marx never fixed this. I also find it interesting that the hole in the motor side plates for mounting the smoke unit bellows is included in every non-smoking 333 and 1829. 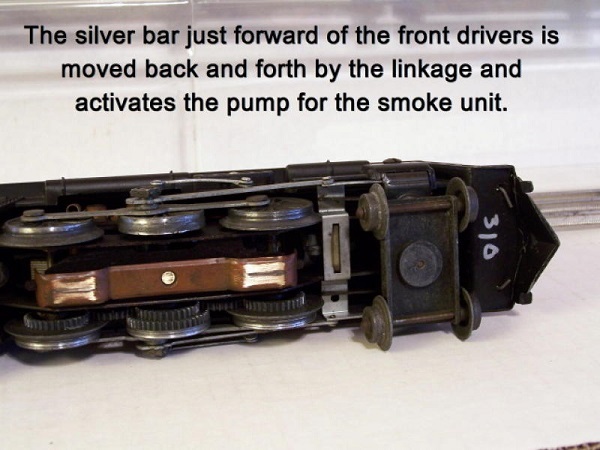 Tasker did some research and found that the Marx smoke unit was under development in 1948 and Tasker suggested to me that Marx probably had the 333 motor tooling set up in advance to accommodate the smoke unit when it was ready for production. The motors between the 333 and 1829 are not interchangeable. The 333 motor does not have provision for the rear truck mounting plate that is included in the 1829s. Many smoking 1829s had a rubber tire on one drive wheel. From our discussion last week about 1829 traction problems, it is apparent that the traction tire is really needed in the smoking 1829 because there is not enough room for the very heavy front weight that the non-smoking 1829 has. But there were also a few smoking 333s with a traction tire, but not a lot. They usually came on 333s in sets that had a lot of cars in the set. John Ruckle commented today wondering why no 333s were produced in 1953. Tasker and I talked about that. Tasker thought that with all the changes in the Marx train line for 1952 and the terrific sales of trains in the early 1950's, the factory might have been overwhelmed in 1952. Certainly the 333 was Marx's most complicated locomotive to build, and Tasker thought that it might have been eliminated for 1953 to try to give the production people a break. And the new-in-1953 plastic Hudson gave Marx a much simpler to make large steam locomotive. I don't have a better explanation. While the last 333 in the Sears catalog appeared only in the catalogs on the west coast in 1958 and there appear to have been none produced after that date, it is interesting that the 1974 Great American Railroads logo included the 333. It is apparent that Sales Manager Spike Fitzpatrick would have brought the 333 back again if the Great American Railroads promotion had been more successful in selling Marx trains in the 1970's. Who would have guessed that he was just about 20 years too early! Hi Kenny, The Marx 333's and 1829's each year normally have nearly the same motor. The 1829 motor frame includes small slots at the back for the plate that the rear truck fastens to. The 333 does not have the plate or the slots since the rear truck is fastened to the body. So while they are essentially the same, a 333 motor will not fit or work in an 1829, and is just visibly wrong going the other way. The piston side rods are also usually (but not always) different on the two non-smoking motors. The motor itself was changed quite a bit over the years. The die-cast 333 Pacific 4-6-2 type locomotive was tooled in 1948 and the 1829 plastic Hudson 4-6-4 locomotive was tooled in 1953. Both were non-smokers until 1955 when a smoke unit was added to the motor. In the early years, the wheels on the front truck of the 333 had a small flange and while they worked well on the O-34 track, they did not work so well on O-27 curves and some operators of early 333's are plagued with derailments. Slightly larger wheels and flanges on later locos fixed that problem, but it is very hard to tell which has the larger wheels and which does not from a photo. A short run of 333 bodies without the awnings over the cab window was produced with the smoking motor in early 1955. Then the awnings were added to the 333. The insides of the body at the front of a non-smoking and a smoking 333 were quite different, and you cannot satisfactorily swap motors between the two. So every 333 with awnings should be a smoker, but without awnings it could be either. On both motors the front truck was changed slightly to move it back centered under the steam chest for 1955, and the cylinders were modified very slightly on the 1829 body to clear the front truck wheels. There are a number of different gear ratios used in these motors. On the non-smokers you would need to count gear teeth on the motor to see the differences. On the smokers the pinion end of the armature was changed dramatically for 1955 and the gear ratio changed to increase the power of the motor and reduce somewhat the top speed. All of the 1829's have a plastic body, and there are two cast weights inside. The rear weight is captured by the cab floor, so it is almost always there. And on the non-smokers the headlight is attached to the front weight so if the headlight is there, the weight is also there. (By the way, the mount and the body provide for two screws to hold the weight and headlight assembly in place, but on every example I have seen, Marx only used a single screw to hold the assembly in the body. On the smokers, the front weight is a bit difficult to reinstall if you take the motor out, and far too many of those have been lost. The 1829 pulls very poorly unless both weights are in place. 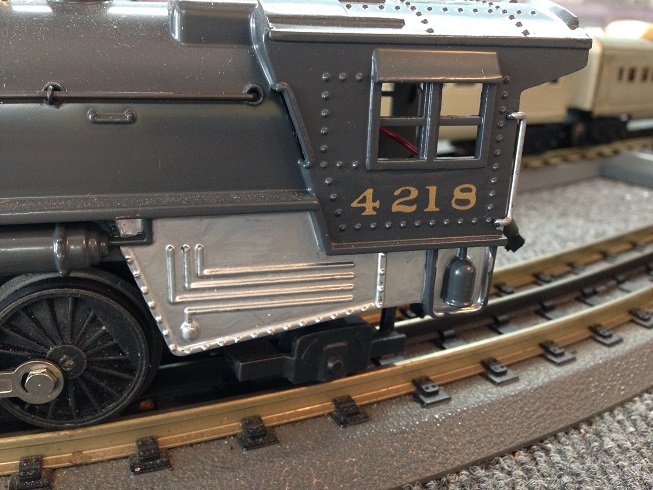 If you are familiar with Lionel locomotives, you may be disappointed with the pulling power of these locos. They have the same field, field windings, armatures, brushes, etc. as their 4-wheel Marx brothers and only four of the six drive wheels pull on the rails. So with the added gears and more axles to turn, often (but not always) a Marx 666 will out-pull a 333 or 1829. Then there is the tender. 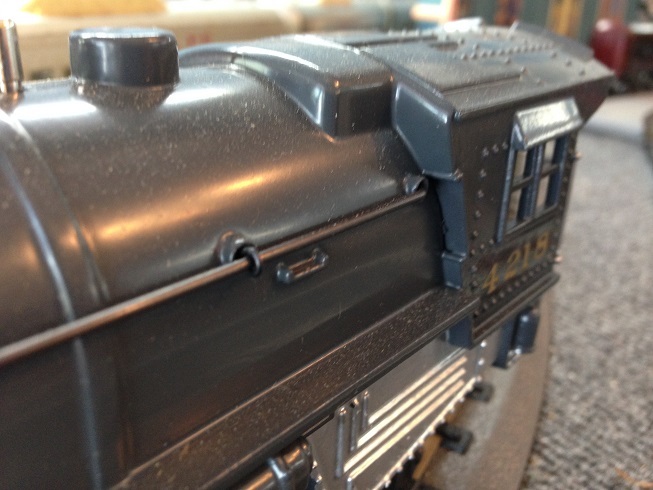 The die-cast New York Central tender with the 3/16 scale wheels usually came with the non-smoking 333. But with the small wheels and non-bearings on the tender trucks, it is very heavy and hard to pull. The wheels and axles need to be lubricated (I like either Vaseline or Labelle 106 grease, but other members of this group have other favorite lubricants). But even with lubrication, it was too hard to pull and Marx replaced it with a much lighter Santa Fe plastic tender on blackened scale trucks when the smoke unit was added in 1955 and the length of toy trains had gotten longer. In other words, the die cast tender looks great, but it is not fun to run unless you have only short trains. The 1829 tender was either a wide Santa Fe 2731 with a railing around the back if it came with freight cars, or a narrow Santa Fe tender on high trucks if it came with passenger cars. When an 1829 Hudson is painted, it no longer looks like plastic. But painting it is difficult because of the way the valve gear is mounted to the body. But the 1829, like the Marx #400 was an early plastic locomotive, and if you look at one carefully you will see the piping on them is not straight or even in thickness, the rivets are not evenly spaced, and straight lines on the cab and on the visors are not straight. It looks like it was carved by hand into the mold and it probably was. Certainly there was no computer driven lathe or laser making the tooling! K-Line made both the 333 and the 1829 (they wisely painted the plastic Hudson in circus colors to hide the hand-carved look). Both contain modern can motors, and while the K-Line plastic Hudson is too light to pull well, the 3XXX series die-cast locos made by K-Line are great pullers. From a few feet away, your visitors won't be able to tell the K-Line and Marx locomotives apart. But don't run a K-Line loco on an old power supply as the voltage spike from a minor derailment will (the voice of experience here) fry the computer board in the loco that controls the reversing. And those boards are getting very scarce and hard to buy. Run the K-Line locos only with a modern power supply. The Robert Grossman Company (www.trainpartsformarx.com) has a number of K-Line tooled replacement parts for these locomotives, including the valve gear components. That is probably more than you ever wanted to know. Good Luck on your quest for one of these locos. Hi again Kenny, With apologies in advance to Roger A, either a Marx 1829 or a Marx 333 without a smoke unit will smoke for a short time if run on full voltage on a ZW. And to make matters worse, the 1829 will get swaybacked from excess heat rising off the motor if it is run for an extended time in excess of 14 or 15 volts or if it needs lubrication and is pulling a heavy load. Marx motors don't like the high voltages many Lionel transformers are capable of sending to the train, and they will overheat with considerable damage as a result. Sears sold a lot of non-smoking 1829's and Montgomery Ward sold a lot of smoking 1829's. Which version you find more of depends somewhat on which of those retailers was dominant in your community. Identifying a smoking Marx loco is easy if you are holding it in your hand, but can be harder if all you have is photos, like on eBay. The side rods on the 1954 non-smoking 333 locos do not have a separate piece going into the steam chest and don't have a rivet at the front (although the side-rod is embossed to look like there is one). They are identical to the one-piece side and piston rods on most (but not all) of the non-smoking 1829 plastic Hudsons. If you look at the bottom, there is a significant unused open space between the motor side plates, in front of the reverse unit and behind the steam chest/front truck mount piece. If you look down into the smokestack, you can see into the cavity where the headlight bulb is mounted. On all of the smoking 333 and 1829 locos starting in 1955, the space between the motor side plates at the front is filled with the gray cast smoke unit. The side rods are identical to the 1948-1952 version except that the piece where the piston rods go into the steam chest is a single piece for both sides that goes across the bottom of the motor, rests on a blackened tin hanger part, and has a slot in the center where a plastic piece of the smoke unit bellows sticks through. Thus the motion of the side rods moves the bellows that pumps the smoke. You can usually see one of the bends in that part in a photo from the side of the locomotive. This is an aside, but you will see a round metal disc in the bottom rear of the smoke unit with a small hole in it. This is the chugger. Unfortunately with all of the motor noise, and rattling on the tracks, you can't hear the chugging. Marx first touted the "chug-chug sound" in their advertising, but since no one could hear it outside of the model shop, they stopped advertising it. And at the very end, they left the disc out of some of the smoke units. 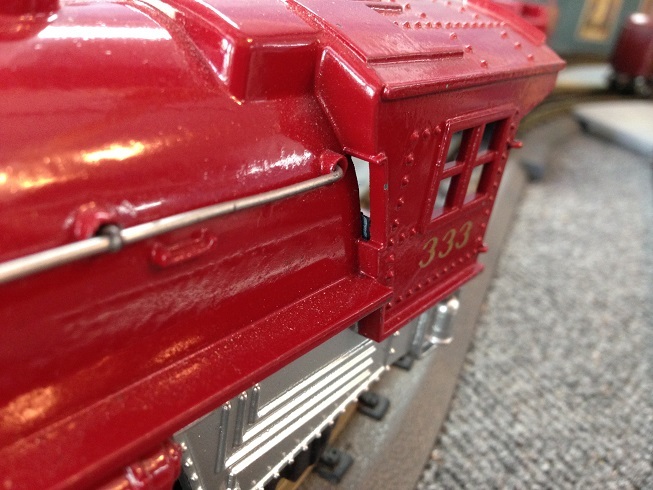 If you look down into the smokestack of a smoking 333 or 1829 you should see a red plastic piece that fills the gap between the top of the smoke unit and the inside of the body shell. In most 333's it does not fit very well, and normally is not centered under the stack. When the train is running, the headlight bulb illuminated that red plastic piece and gave a red glow inside the smokestack. Sometimes that piece is broken, and if it is broken, the bellows can't push air down into the smoke chamber, and it won't puff smoke. Bob Grossman has reproductions of that plastic part. Lionel trucks cannot be added to the Marx die-cast tender without ruining the base, and raising the tender up on high trucks will cause it to catch on the back edges of the cab and derail on the curves. And if you have a Marx die-cast tender with a plastic forked coupler, it is a 1954 only piece and is rather scarce. Much better would be to mount a Marx large-wheel freight car truck on one end of a Lionel freight car. That will give you a car with a Lionel coupler on one end and a Marx coupler on the other. Another alternative is to get a junk Lionel car with a coupler assembly that hooks over the axles, and then take a Marx high-wheel truck, remove the Marx coupler (or cut off the hang-down tab and swing the truck around), and hook the Lionel coupler assembly over the Marx axles. It will fit perfectly, and again give you a transition car. If you have a Marx freight car with the high trucks and the short-fork metal coupler, you can just have a Lionel coupler facing one way and the original Marx coupler facing the other on one of the trucks. Then you can just swing the truck around to whatever coupler you need at the moment. Some Lionel tenders will work fine with the Marx 333, but only if the drawbar at the front of the tender is long enough to clear the cab roof on the curves. NOTE: I still have the original box for this K-Line loco. So, I am confident that the model number is correct even though it is repainted. If you know of other model numbers for the K-Line version please let me know. If you have a photo you would be willing to have included here, please send it along with a note. You can find my email address on the Contacts page. It also appears that there is quire a bit of information already in the message archive regarding the K-Line product. It may be we will need another page for just that.